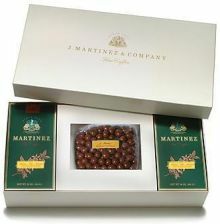 The J. Martinez & Company presentation gifts are an elegant and generous alternative to the standard gift basket. In a handsome package, the presentation gifts are very flexible and can be made up in a variety of ways to accommodate any budget. Whatever the occasion -- Christmas, Birthday, Hanukkah, Mother's Day, Father's Day, Secretary's Day, a gift for your hostess or a child's favourite teacher -- our presentation gift box is suitable for year-round gift giving. It also makes an ideal corporate gift. You may wish to pair one of our gift selections with a Saeco espresso machine. For your convenience, we offer six Gift Selections with pre-selected coffee options to accomodate any budget. Customers who prefer to customize their gifts may purchase one of our elegant gift boxes to fill with the coffees of their choice.